Srinagar: On the occasion of World Arbour Day, J&K Bank conducted a plantation drive wherein scores of saplings comprising of various species were planted here in the picturesque Badamvaer Park. Notably, the park is developed and maintained by the Bank under its Ecology and Heritage Preservation Program. 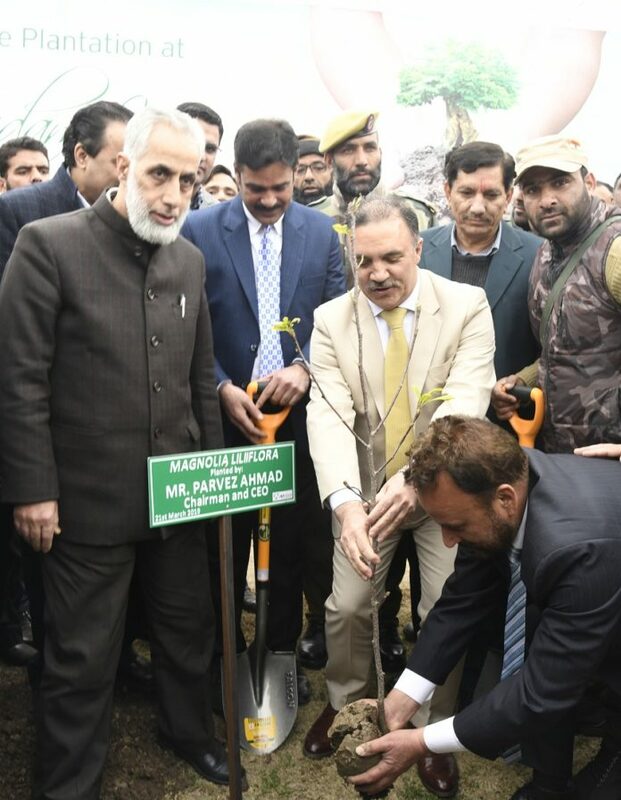 Led by the Bank’s Chairman and CEO Parvez Ahmed, the bank’s Executive Presidents R K Chhibber and Abdul Rashid Sheigan planted saplings of species like Magnolia Lilliflora and Magnolia Soulangeana in the park. The Presidents, Vice Presidents also participated in the plantation drive by planting saplings of Prunus Dulcis across the park. ‘In future we are also contemplating to get our buildings certified for environmental sustainability besides constructing only green buildings in future to minimize the environmental impact of our infrastructure’, added the chairman. Pertinently, the Bank has revived, developed Badamvaer and continues to preserve and maintain its matchless charm for more than a decade now. The park has come up as an attractive destination in spring and summer and beyond not only for tourists from outside Kashmir but has become a hub of social and familial communions, celebrations for visitors from across the valley beside locals. The park flaunts a properly designed Jogging-track that runs for one and a half kilometer and presents itself as a godsend gift for the health conscious irrespective of their age or gender. Every day, hundreds of locals from adjoining areas including senior citizens, women and children can be seen jogging on the track, soon after the dawn breaks.